Home > ICOM > BP-83xh : 7.2v 2200mAh LONG LIFE rechargeable Ni-MH battery for ICOM radios. BP-83xh : 7.2v 2200mAh LONG LIFE rechargeable Ni-MH battery for ICOM radios. 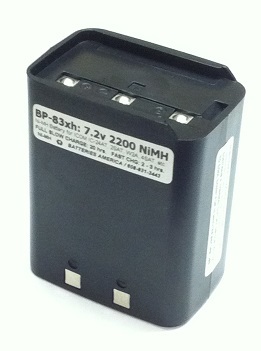 BP-83xh :7.2 volt 2200mAh long life rechargeable Ni-MH battery pack for ICOM radios. EXCLUSIVE DESIGN; UPGRADED SPECIFICATIONS. Battery pack is 2 1/4" tall. Fits radios such as IC-2SAT, IC-W2A, IC-24AT, IC-4SAT, IC-2SRA, IC-4SRA, IC-M7, IC-R1, etc. Replaces original ICOM BP-81, BP-82, BP-83, BP-84, etc. Re-charges thru the radio with a Wall Charger, or in a desktop smart charger such as Batteries America EMS-79A or EMS-173-180. This battery provides exceptional operating time. If you need a new Plug-in Wall Charger for your radio, look on the TOP of the HT. If the DC input jack is a 3.5mm hole with a metal Pin visible in the center, then you require our WC-AIC or BC-110AR wall chargers. If the DC input jack is a 6mm hole with an extra insulated hole in the center (double coax), then you require the BC-105A wall charger. 2SAT NiCd: 7.2 volt 350mAh rechargeable battery that goes inside ICOM radios such as the IC-2SAT, IC-3SAT, IC-4SAT, etc. Includes connector. Installation required. These battery packs are manufactured in the USA by BATTERIES AMERICA. 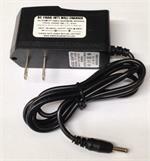 BC-105A : ICOM wall charger for 7.2v battery packs. Plugs into wall outlet, then plugs into top of radio. The BC-105A is an ICOM-brand factory wall charger for ICOM 7.2v packs. Plugs into top of ICOM radios that have the special combination coax and pin receptacle. Plugs into 110-120VAC. Output is 12VDC @ 200mA. 2SAT Ni-MH : 7.2 volt 700mAh NiMH internal battery for ICOM radios - fits in IC-2SAT, 3SAT. 4SAT radios, etc. The 2SAT NiMH is a 7.2 volt 700mAh replacement rechargeable LONG LIFE Ni-MH battery for ICOM radios (internal). Includes connector. Provides over twice the run-time of the original insert! Installation required.